The cast includes: Ralph Fiennes, Kristin Scott Thomas, Willem Dafoe, Colin Firth and Juliette Binoche. Tagline: In memory, love lives forever. Colin Welland received the Screenplay Oscar. Milena Canonero won the Oscar for Best Costumes; while Vangelis won for Original Music Score. 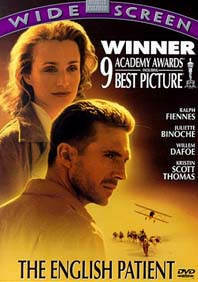 Following a horrible plane crash, a British pilot (Ralph Fiennes) is nursed back to health by a sympathetic nurse (Kristin Scott Thomas).